As you know that Safety is important in electricity works. Today i am writing about shunt trip breaker wiring diagram which related with safety and protection of electricity. As you know that electricity is dangerous but it's become more dangerous when it's upgrade from the 220 volts to 3 phase 440 volts. As you that mostly we use 3 phase system in industrial state where we can not protect our electrical distribution using RCD (residual current device). In Single phase wiring or house wiring we use electric power supply between phase and neutral which can be control by using a simple double pole RCD Breaker. But When it's come to high load places or where we use the three phase supply then use a MCCB (module case circuit breaker) Shunt trip circuit breaker with emergency push button switch which we know better with name of EPO (emergency power off) button. Shunt Trip Breaker Wiring Diagram with EPO Button. 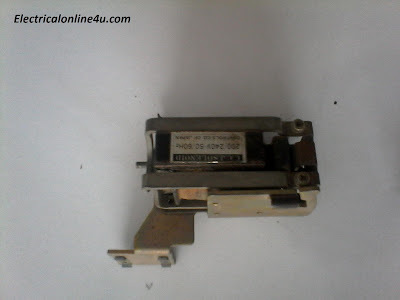 In this post i am just tell you about wiring of single EPO button with shunt trip MCCB breaker. In industrial state, Electric operator duty is to operate the machinery and his duty is on the front of Main panel board. Now if a short circuit is done in electrical instillation or other electrical accident, the operator can easily push a small push button switch and the all electric power supply will powered off. If we comparison it between switching off the main circuit breaker then it's will get more time. In the advantages of shunt trip breaker, a most important things is that we can instill the emergency switch (EPO) anywhere, from where can easily push button or where the push button is near to us. One thing more that we can instill more then one EPO buttons for one breaker and every button will work same. However is this post shunt trip breaker wiring diagram i shown only one EPO button and INSHALLAH in next post i will show you instillation of multi EPO (emergency power off) buttons for a single shunt trip MCCB breaker. How to wire 3 or 4 pole MCCB Breakers? How to wire RCD Breaker? The shunt trip move able rod hit the tripping point or disconnecting point of circuit breaker internally and the breaker become off or trip. In the MCCB circuit breaker, we have a push able button or place which is named with "push to trip" and when we switch on the breaker and push this button the breaker become switch off and trip due to pushing this button. 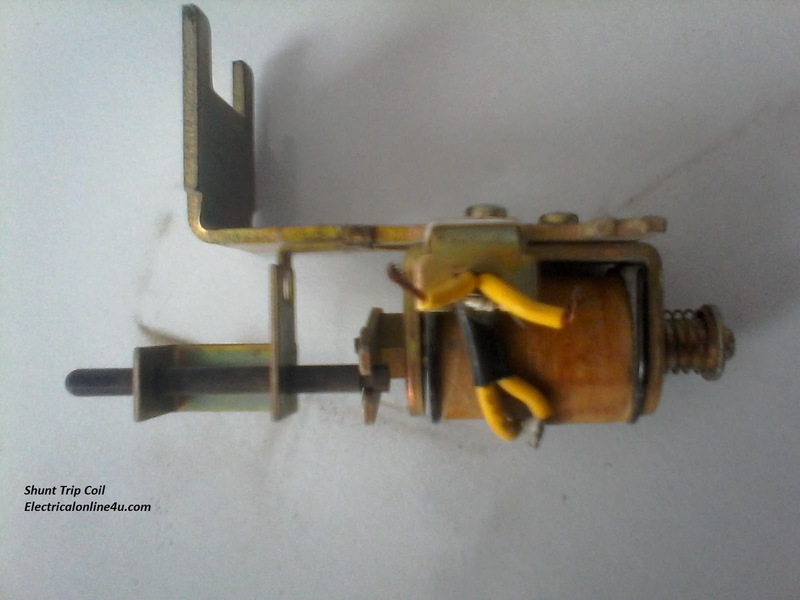 The shunt trip coil rod push this point internally when the shunt coil is operate. Here is some images of shunt coils and after that we will discuss the shunt trip breaker wiring diagram with image + symbol diagram. 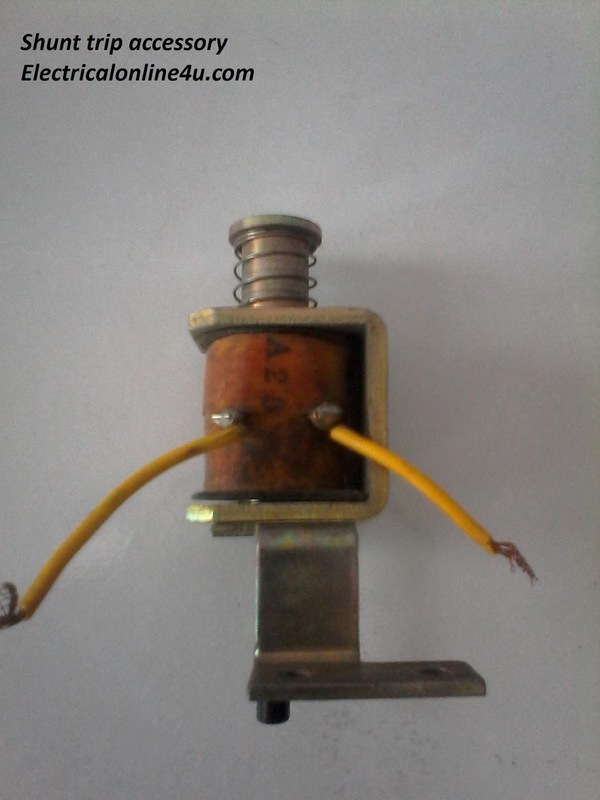 Now lets how to wire shunt trip device (accessory), it's too simple as i shown in above shunt trip device images that a shunt coil have only to wires , just like a magnetic contactor or magnetic relay coil. But you must provide the power source regarding coil rated volts. 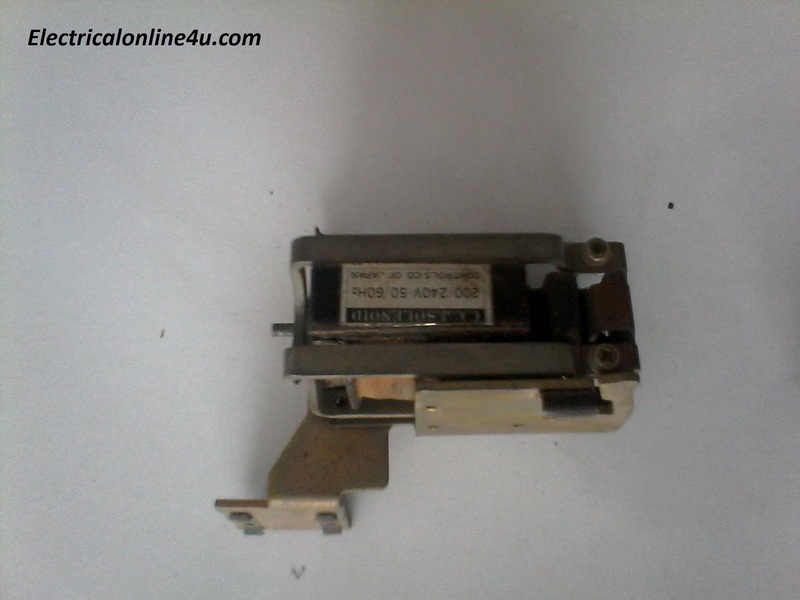 You can find out the rate coil label on shunt coil, circuit breaker or on shunt trip coil. But the question is that how to wire it. And the answer is that "it's also too simple". We use a push button switch for shunt coil which we know with it's short name "EPO" which i discuss in my above words. In EPO switch we have four terminals in which tow are Normally close with each other and other two are normally open. So we need to provide the supply / current to the shunt trip device circuit breaker when the emergency moments come. I.e example " if we have a shunt trip coil which is operate on 220 volts, so we need to provide the 220 volts AC current to shunt trip coil to operate or to do trip the breaker in emergency time. So our neutral will be connect direct to the shunt tripping coil and Phase (hot wire) will be connect to coil other side through the EPO push button switch normally open contacts. So the EPO switch will be normally open and when we push the switch in emergency time the switch normally open contacts will make a close contacts connection and the hot wire current start flowing to the coil and complete the circuit because the neutral wire current is already connect to coil. So the coil will make a magnetic field and push the rod, the rod will press the trip point and breaker will disconnect the power supply to load. Here is complete explanation of shunt trip circuit breaker wiring diagram which help you understanding completely. The main purpose of a shunt trip breaker is that we can easily switch off main circuit breaker form our nearest place in short time and can safe us from electrical accidents. To wire a shunt tripping breaker follow the below steps. First of all wire your Circuit breaker. Then connect the neutral wire to shunt trip coil. Then connect the Phase (hot wire) to the EPO button normally open contact. Then get connection form EPO other side of normally open contact and connect to the shunt trip coil. That's all you done it, in the above diagram, i shown the complete the of shunt trip circuit breaker wiring diagram using image and symbol diagram, however now if you have any question regarding the shunt trip breaker wiring diagram with emp switch or want to gave us some suggestion then use the below comments section below. Hi, I have a three phases circuit breaker, with 4 incoming cables and 4 cables to load (even the N cable is connected through the circuit breaker). Is it correct to connect the shunt trip to the phase and N in the load side of the circuit breaker?